The Erriff Fishery is one of the premier salmon fisheries in Ireland. It is located in Leenane, County Galway and comprises the Erriff River and two small loughs, Tawnyard and Derrintin. 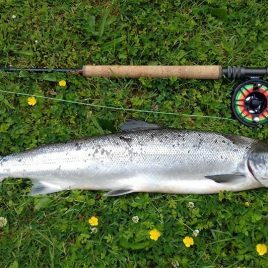 The River Erriff is renowned as a salmon fishery, with regular guests returning year after year to experience the wonderful fishing in these stunning surroundings. The fishery is comprised of the Erriff River and the two lakes of Tawnyard and Derrintin. A spate river, it is characterised by lively streams and deep fish-holding pools. It has 8 miles of prime angling water, divided into 9 beats, which are rotated amongst anglers on a daily basis. Fishing is uncrowded with only two rods on most beats, and a maximum of 3 on the remainder. Flyfishing is the norm, but spinning, worm and prawn may be permitted by the fishery manager in certain circumstances. Tawnyard Lough is 250 acres in size. It gets a run of grilse and sea trout from June, and there is very lively brown trout fishing to small flies. The lough is situated high in the hills, in a most scenic area of South Mayo. Fly-fishing and dapping are the only permitted methods of fishing. Boats and outboard motors are available to anglers.